Next Wave Festival is known for risky and sometimes strange art, but Bennett Miller’s Dachshund UN has given it the label adorable around the world. 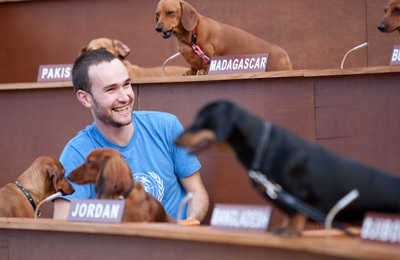 Miller has built an installation for the 2010 festival that reconstructs the UN Commission on Human Rights with each nation represented by a sausage dog. The quirky artwork has been picked up by media outlets around the world probably because it features 47 highly photogenic dogs. The installation finishes on Saturday - the last chance to catch the pups barking out for Human Rights.